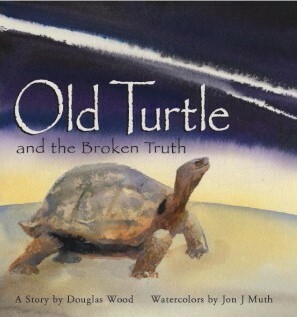 Old Turtle returns in a timeless story about love, acceptance, and the nature of truth. In a time when every stone is a teacher and every tree a ladder to the stars, the people live in peace. Then the people discover a powerful truth that gives them strength and happiness. But they do not see that their Truth is broken and incomplete. And because they do not share their Truth with other people and other beings, all earth begins to suffer. Then a Little Girl journeys to find the ancient wise one known as Old Turtle. With words both simple and profound, Old Turtle helps the Little Girl to hear again the language of breezes … and passes on the precious piece of wisdom that will mend the people’s broken truth. Douglas Wood’s stirring and eloquent fable, soulfully illustrated by Jon J. Muth’s luminous watercolors, offers readers of all ages inspiration, hope, and a healing vision of peace.